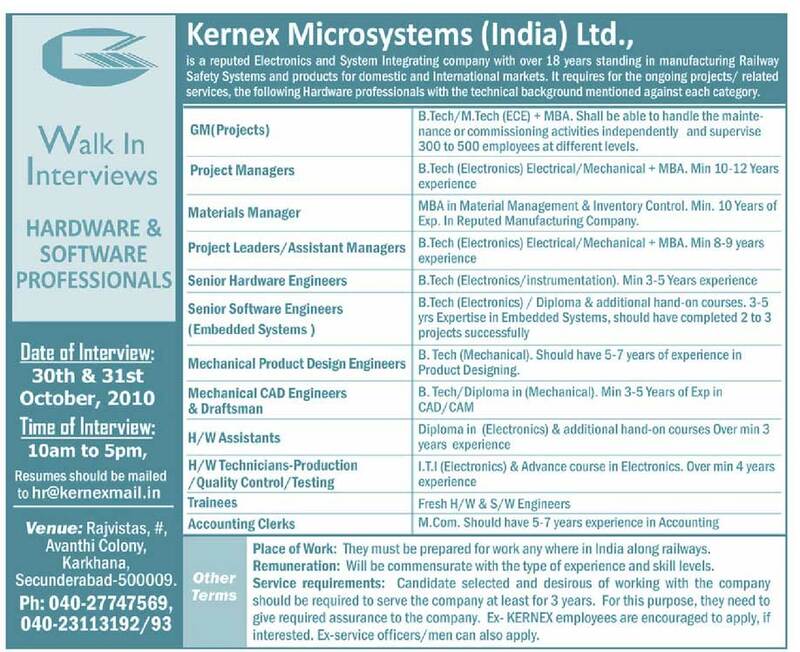 Kernex Microsystems a reputed Electronics and System Integrating company with over 18 years standing in manufacturing Railway Safety Systems and products for domestic and International markets. It requires for the ongoing projects/ related services, the following Hardware professionals with the technical background mentioned against each category. B.Tech/MJech (ECE) + MBA. Shall be able to handle the maintenance or commissioning activities independently and supervise 300 to 500 employees at different levels. MBA in Material Management & Inventory Control. Min. 10 Years of Exp. In Reputed Manufacturing Company. B. Tech (Mechanical). Should have 5-7 years of experience in Product Designing.